MVPs Unplugged: Real-World Microsoft Exchange Server Designs and Deployments. This is a panel with Jeff Guillet, Nic Blank, and Sigi Jagott, so I am really looking forward to it. I love panels in general, and my co-presenters are incredibly knowledgeable about the ins and outs of large and small Exchange deployments. 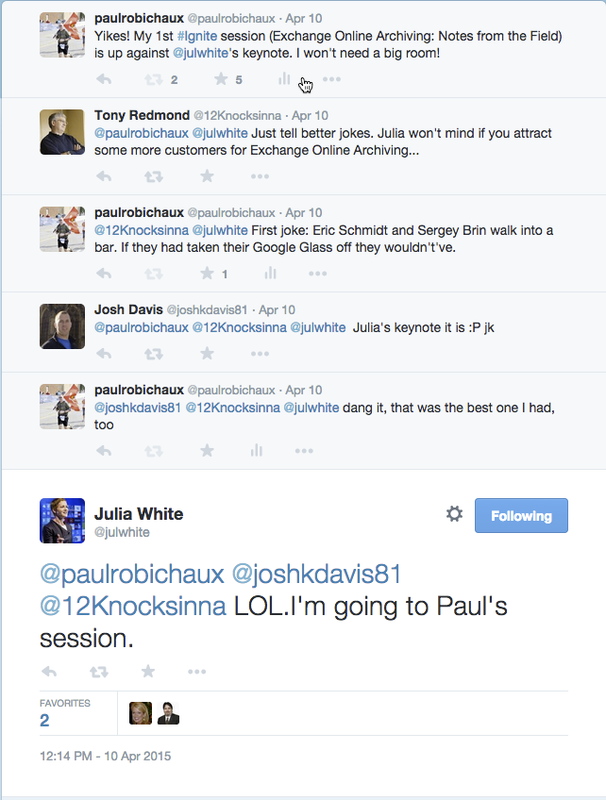 Exchange Online Archiving: Notes from the Field. Archiving is one of those topics that isn’t interesting to everyone— but for people who are interested, they tend to be very interested. In this session, I’ll be talking about various aspects of EOA, including what it is, how it works, and how to efficiently move to it. Servicing Microsoft Exchange Server: Update Your Knowledge: this is a joint effort between me and Microsoft’s Brent Alinger. As you may know, he is Mr. Exchange Servicing. I’m really excited to have the chance to be onstage with him. He has some very interesting (dare I say “provocative”) things to say. I consistently find that people misunderstand (or maybe under-understand) how Exchange servicing works and why Microsoft does things the way they do, and I think this session will help shine a brilliant beam of knowledge down from the mothership. As always, Microsoft has deployed a whole behind-the-scenes infrastructure for managing all this stuff; this year, the system allows attendees to register their session preferences, and we see projected attendee numbers in the speaker portal. When I check these sessions in the speaker portal, all 3 of them are shown as having more enrollees than the currently booked rooms can support— that’s an excellent sign. In addition to our assigned sessions, Microsoft has asked each speaker to conduct peer review of other presentations. In addition to the sessions I’m presenting, I’m peer-reviewing sessions on Clutter, Office 365 Groups, and SharePoint enterprise search (pretty sure this last assignment was an accident). We’re also all supposed to man the show floor Office 365 booth, plus there are various side events to plan and RSVP for. In particular, if you haven’t yet requested an invitation to the Scheduled Maintenance party, you’d better act quickly; I hear it will introduce a new level of awesomeness. Apart from my sessions, the only logistical item I have to complete is to book my flights; until the session schedule is finalized, I can’t. While I’d much prefer to fly myself, Microsoft only covers commercial airfare for speakers. I might fly myself anyway, though! The workload is ramping up quickly as we get closer to the event, but it should pay off with some excellent sessions. I’m looking forward to Ignite– drop by and say hello if you’re there!